Carcassonne is simply the most famous, most fabulous monument between Monte Carlo and Bordeaux. 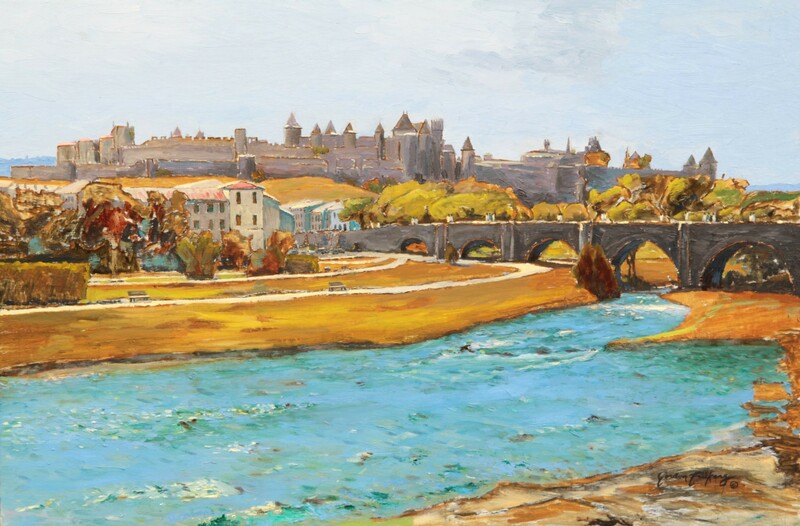 A landscape painting of Carcassonne by Gordon Frickers measures 76 x 121 cm (30″ x 48″), oils on canvas, available, £3,000. ex studio, ex frame. If you don’t know of and have never visited Carcassonne this famous city, who’s visitor’s book includes illustrious and famous names including Walt Disney, Mark Twain, Winston Churchill and even Mik Jagger, should be on your list for one of your most memorable days out. 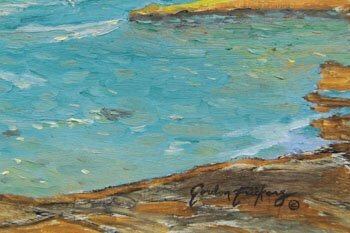 A painting that hangs comfortably with the finest collections. The workmanship here started fast loose and intense hence a friend describing this painting as “plum pudding & lobster salad“, a term used to to describe some of J M W Turner’s works. 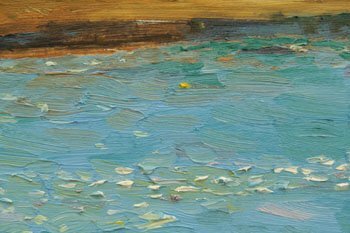 Turner has since early days at Art college, been one of my heroes. He had some of his work described as ‘lobster salad‘ hence my delight in my mate’s choice of phrase. As is sometimes the case to truly appreciate the qualities of this luminous landscape you do need to see the original, that included the reality of visiting, discovering for yourself, this famous historic city, however I trust this introduction will tell you much and be of pleasure and interest. 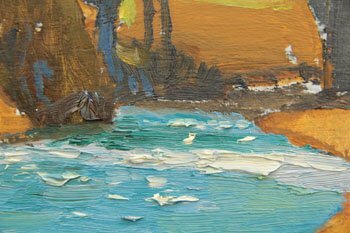 For this carefully planned original painting, I have visited the city and it’s environment 5 times before settling on how and why I have chosen my compositions. 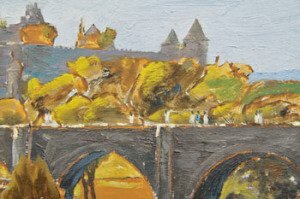 This painting represents the beginning of a new mini series, intended to be 6 fair sized paintings of differing aspects of Carcassonne introducing the vineyards, river and a peep into the inside of the old city. This painting was influenced by Feng Shui, ideas that encourage and inspire a positive atmosphere in a home or work place. Watch the blog for progress and when and where they will be exhibited. In some ways as the details here reveal the picture is less conventionally ‘finished’ than much of my work. This is quite deliberate; to enhance the vibrant luminous impression, to help you feel the warmth of the Mediterranean air and hospitality of the people. 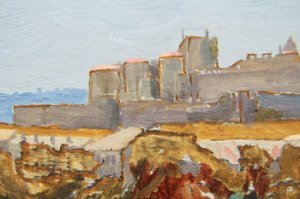 Thus here for those of you interested in the techniques and philosophy of painting is a feast of ideas and information among the details posted for you. Never the less this painting merits 7 detailed insertions for you to enjoy and consider. 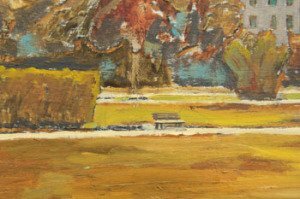 Like to own this original? Talking is free and fun, contact us. The strong walls of Carcassonne have since early medieval times protected the inhabitants, encouraged regional trade and prosperity by standing firm, security between the Mountainous Pyrenees to the west and Les Montaines Noir, Black Mountains to the East, the plain of Narbonne and Mediterranean in the south, Toulouse and Bordeaux to the North. It is the latter mountains, mostly a regional National Park, that appear as background left hand side in this painting while to the right is a glimpse of the wide valley that leads you to Narbonne and the Mediterranean Sea. To explore, to dine at one of the many charming reasonably priced restaurants of Carcassonne has to be one of your life’s special moments. You will find the city South of Toulouse, North of Narbonne, often basking in a Mediterranean climate, the ancient medieval walled city of Carcassonne. The city guards the Northern route through Languedoc-Roussillon, a major wine producing region that corresponds approximately with the ancient Bas-Languedoc region and the vast Roman province of Narbonne. During the long Roman centuries the region prospered as part of the extensive Narbonne Province, a department extending from the Alps Maritime to Barcelona; many echos remain. Echos can still be heard by the keen ear, seen by knowing eyes in the cultures and architecture of the former grand province. In the city and surroundings of Carcassonne, on the bubbling banks of the river, those echos linger in the accents of the people, of a regional language (l’Occitane) and music shared, traces of the Cathars and their version of Christianity, exterminated by a crusade ordered by the rival Roman Catholic church, stories of besiegers imaginatively and invariably fought off… including Prince Edward, the “Black Prince”. Today Carcassonne is very much a place of song, dance, good eating, fine wines where the best of the medieval period is celebrated, a city renowned for the most impressive Bastille Day firework display in France and a safe place for a dip in the river. Regularly since 1898, the medieval City of Carcassonne has been the setting for some of the most spectacular fireworks in the world on the evening of July 14, Bastille Day. Carcassonne is a city visited by a very long list of distinguished people as varied as Mark Twain, Winston Churchill and Mick Jagger, Carcassonne is and has been an inspiration including to Walt Disney. What ever, Carcassone, can sprinkled a magical spell over you, enjoy.